In Vajrayana Buddhism, the Diamond Realm (Skt. 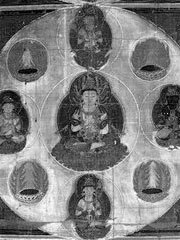 vajradhātu, Jp. 金剛界 kongōkai) is a metaphysical space inhabited by the Five Wisdom Buddhas. The Diamond Realm is a very popular subject for mandalas, and along with the Womb Realm (Garbhakosa) Mandala forms the Mandala of the Two Realms.